According to CBAT Transient Objects website we've got a bright supernova in M82 (V = 11.7). According to ATEL #5786, this object was classified "as a young, reddened Type Ia Supernova". Since we know the distance of M82 is approximately 3.568750 Mg pc's and a terminal absolute magnitude of -19.3 has been assigned to Type Ia supernovae; it follows that an upper maximum apparent magnitude for SN 2014J can be calculated. mv = -19.3 -5 + 32.75 = -24.3 + 32.75 = +8.45. Obviously; as our supernova lies cocooned in the spiral arms, peak magnitude will be less than +8.5. The question is; by how much? To take an intuitive guess, let's knock off 1.5 mags, and predict SN 2014J will touch +10.0. Quite soon, now. I think there might be a way to estimate the reduction from theoretical maximum mv value due to attenuation of interstellar "stuff" by examining the reddening. This SNe seems quite red for a type 1a. I the paper by Munari, Henden, et. al., BVRI Light Curves, of Supernovae ... the b-v pre maxima for type 1a seems to be around 0.5 this one seems to be around 1.2 or 1.3. b-v at maximum normally between -0.2 to 0.0. Therefore, although I don't know the formula, I bet there is one (or several different ones) to calculate the reduction in magnitude from reddening. Anyone have a reference for such a calculation? Yes; this occurred to me – that there should be a relationship connecting the B-V quantity with the reduction in apparent magnitude of a Type Ia supernova. If that were not the case; how could these objects be regarded as reliable “standard candles” at all? Indeed, the proposition that universal expansion is accelerating, hangs directly on this question! Perhaps Arne can help us out here; or anyone who has a pertinent contribution to offer. I'm surprised that SN 2014J has provoked so little discussion, thus far. Well, rivers of ink and uncountable photons seem to have been devoted to this topic. Attached is one frequently cited paper discussing attenuation by the other galaxy, the Milky Way galaxy, "this , that and another thing or two" with references to the leading models that are used to correct for the effect of all of the "stuff" between the SNe and us. I think one could spend several months if not years trying to develop a decent understanding of the subject. I will probably spend a few days obtaining a very incomplete understanding. The attached is a start. I, too, am surprised at how little discussion there has been on SN 2014J. I went out last night in the bitter cold and visually observed it at 10.8 mag. It is a beautiful sight, very easy to spot in my 10 inch reflector from not so dark skies. M81 and 82 are so easy to find, that I hope that lots of people are viewing visually. I even had to yank this topic out of the bottom draw on the 28th, and stir it into life. Now, the thing is sinking to the end of the pile again! There's interesting questions that haven’t yet been framed. For instance; why wasn't this bright supernova recognised earlier, given the much vaunted coalition of SN searches supposed to be in hand ? Or; why did the appearance of V339 Del provoke so much greater excitement among our membership? In short, we're looking to a forum to be afloat with sparky and provocative ideas. Least of all, do we wish to write the script ! I have a couple of ideas why this is so, particularly in my case. 1. I live on the East Coast, and we have had very few clear nights. Its also been very cold, snow on the ground. 2. Nova Del had regular feedback from Arne, encouraging the observers to improve their technique and obtain close agreeement. I have noticed that a campaign needs a campaign leader to practically daily get on the forum, answer questions, and pose solutions. Its kind of like a critical mass component that is missing. 3. Right now, my focuser stopped working, so its back at the factory for repair. Hope this helps. I am sure other observers have similar issues. BTW: I did observe it visually one night from the MMO Open Night about a week ago. I am going to post SN 2014J on the Visual Forum and try to encouorage the visual observers to observe the SN. I am also going to ask that they post any feedback on the Visual Forum. Yes. We'll move to the new topic/title. That's a good idea; we'll migrate to the new topic title. Your point number “2” is very cogent. The thing hasn't been getting lead from the front. That's just the comment I was inviting. On your point “1”...terrible weather here in the UK also. I've just been very luck with several brief windows of opportunity. May not get any more. They are also finding that the standard candle relationship is much tighter in the IR and more and more measurements are being done with that for cosmology purposes. Effects of dust are diminished in the IR. Here is a good type Ia talk where IR photometry is discussed. Well I am on a very high speed internet today and could not get more than the first 50 seconds to play. However Andrew Friedman's Thesis paper that is the subject of the video is available for download, and I did. Here is the URL It is much too large to upload to the forum. Even as a PDF it runs 89 M bytes. Lots of great info in this. 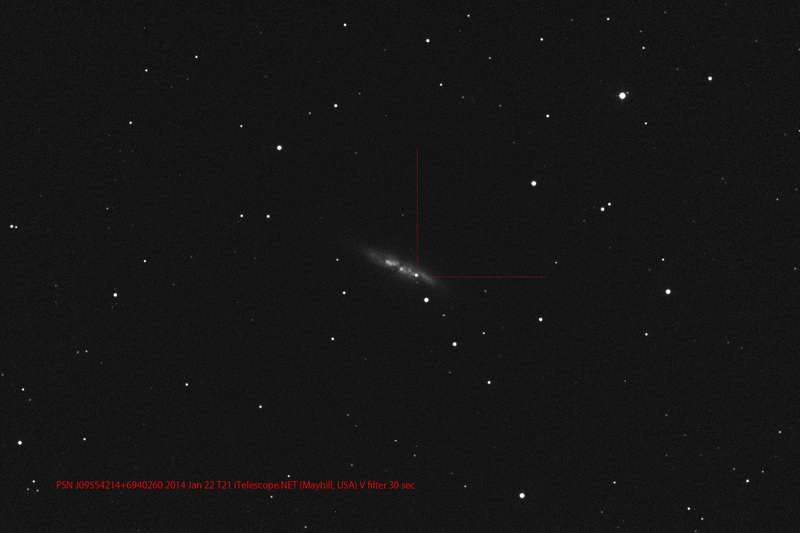 Could we change the title of this topic now, to “SN 2014J in M82”, please. I think it might be helpful to some of our members.